Now, at the first Council, the Peacemaker informed the chiefs that the Tree of Peace had sent forth roots in all directions, the Great White Roots of Peace. ‘These roots,’ he said, ‘will continue to grow, advancing the good Mind and Righteousness and Peace, moving into territories of peoples scattered far through the forest… ‘ —from The White Roots of Peace, by Paul Wallace. 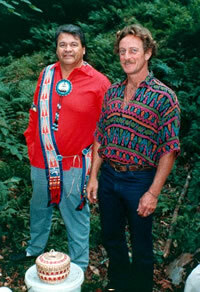 Jake Swamp and John Stokes at an early Tree of Peace planting in the Adirondacks. The Tracking Project has maintained a working relationship with the Iroquois confedaracy since 1981 when John Stokes returned from his work with the Aboriginal Community College in South Australia to visit the Mohawk newspaper Akwesasne Notes at Raquet Point. His friendships with Ron LaFrance, Peter Blue Cloud, Jeane Shenandoah and others from this first meeting led to enhanced communications between Aboriginal Australian groups and the confederacy. Articles regarding Aboriginal issues appeared in Akwesasne Notes while Aboriginal students at the college in Adelaide began to learn more about the Haudenosaunee and other Native American groups. In 1987, Jake suggested that they join their two projects as one. John came up with a name—Tracking the Roots of Peace. The proposed gatherings for “natural and cultural awareness ” would bring together the wisdom and awareness of tracking, the teachings of the Great Peacemaker of the Iroquois confederacy and the Tree of Peace ceremony which Jake had resurrected from the time of the establishment of the Great Law. When the Peacemaker planted the Tree of Peace more than a thousand years ago to symbolize the divine law which he and the people of the confederacy had put into practice, the “White Roots of Peace” were said to extend out in the four directions from the Tree. The Peacemaker told the assembled people that anyone who desired to live in peace might find one of these roots where it grew near their feet and trace it back to this Sacred Tree. Jake and the monkeypod tree on Moloka’i, 1992. Spreading the message of peace and awareness of the natural world, Jake and John have traveled together throughout the mainland United States, Canada and Hawai’i. Their projects have taken up many causes and have assumed many forms: Tree of Peace ceremonies; Sacred Circle gatherings to share Native teachings; mens’gatherings sharing a Native perspective on mens’ work; trainings for environmental lawyers and industry leaders through the Santa Fe Council for Environmental Excellence; publication of Thanksgiving Address: Greetings to the Natural World (together with the Six Nations Indian Museum and the Native Self Sufficiency Center); as well as camps, youth & elders gatherings and school visits with Native youth from Iroquois communities, the Navajo Nation, Puyallup and Tulalip communities near Tacoma, Washington and many other places. On a visit to Hawai’i with Winona LaDuke in 1985, John met a group of Hawaiian activists who were concerned with sovereignty issues, Hawaiian language and culture, as well as putting an end to the bombing on the island of Kaho’olawe. This group included Mililani Trask, Palikapu Dedman, Emmett Aluli, Craig and Luana Neff. From this meeting, The Tracking Project extended its work from the mainland to include Native Hawaiian and Polynesian issues. John Stokes plays a peace song on the yirdaki, Moloka’i 1992. Mililani was very interested in the sovereignty model provided by the Iroquois confederacy and wanted to share that model with her people. At the invitation of Ka Lahui Hawai’i and Ka Moloka’i Makahiki, Tracking the Roots of Peace visited the Hawaiian islands in 1990, 1991 and 1992. Funding for these visits was provided by The Tracking Project under the Arts of Life program. 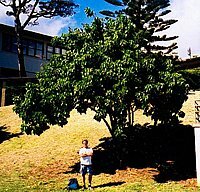 The open space at the Kaunakakai community center shaded by the monkeypod trees in 1998. In 1990, the team met with Mililani Trask and others from Ka Lahui Hawai’i at the Volcanos National Park on the Big Island. Jake shared Iroquois models of sovereignty with the leaders and other elders. The meeting included an awa ceremony conducted by Sam Ka’ai and the planting of two yellow ohia peace trees near the bird sanctuary known as Kipuka Puaulu. 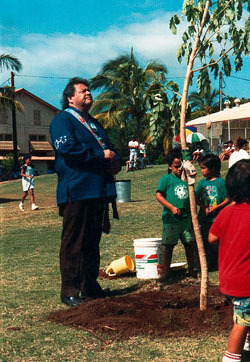 On O’ahu that year, the Swamps, Zuleikha and John Stokes also performed at the Punahou School, planted a Tree of Peace (yellow milo tree) with 100 fifth graders at the Kamehameha School in Honolulu and planted another Tree of Peace (kukui tree) with the students of Le Jardin Academy in Kailua. Kahele and John water in the tree. The second year of the tour in 1991 happened to take place during the exact weeks of the Desert Storm Operation in the Middle East. This second year included: attending Ka Molokai Makahiki, a celebration of traditional games, food, music and peace; visits to all four elementary schools on the island of Moloka’i, seeing nearly all the island’s children from grades K-6; planting a Tree of Peace with Sam and April Kealoha on Moloka’i; spending a day with the Punana Leo kids (a Hawaiian language immersion program) at the Keaukaha School near Hilo; planting a Tree of Peace with all the students of the Keaukaha School; and planting another Tree of Peace (orange tree) on Kaua’i, near the town of Kapaa. In 1992 , the team returned to Moloka’i at the invitation of Walter Ritte and Ka Moloka’i Makahiki. Walter requested that we attend the Makahiki games for a second year in order to plant a Tree of Peace for the entire community. In a ceremony atttended by hundreds of local people, Jake and John planted a monkeypod tree in the large open area at the community center in Kaunakakai. Kamakahukilani blessed the tree with her conch shell and John played music for the tree on the yirdaki. 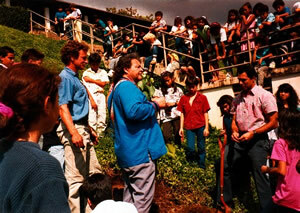 John, Jake, Kahele Kukea and the Kamehameha Schools grade 5 students plant the yellow milo tree in 1990. As the years have gone by, we have had the opportunity to re-visit many of the trees we planted in Hawai’i. We are happy to report that the ones we have seen are flourishing. As Jake teaches, the ceremony surrounding the peace tree plantings is important, because within the story of the Peacemaker’s journey, we find many ideas and strategies for bringing peace to the world. John with his children—Jade (age 5) and Kainoa (7 months)—at the tree 1997. But once the tree is planted, it must also be cared for. And each time we return to visit the tree, we should remember the words that were spoken on the day it was planted. In this way, we can learn to maintain peace. The Tree of Peace planted on the Kamehameha Schools campus in 1990 is a beautiful model of how a peace tree can flourish. Because of our on-going work with the school, we have been able to visit the tree each year since it was planted. (The tree is located at the corner of the playing field next to the stairs between the elementary and mid-school campuses.) Principal of the Elementary School, Kahele Kukea chose the tree and following a traditional Hawaiian practice, placed an octopus into the hole for the tree as fertilizer. John and a class of grade 3 students take shelter from a rainstorm under the peace tree in 2001. A good opportunity to talk about peace and peacemakers. Our photos follow the tree’s growth from the original planting in 1990 through our most recent visit in February 2002. We also include a poster created by Alan Takano, a Kamehameha Schools staff member, showing Miki Maeshiro reciting the Thanksgiving Address for the entire staff of the elementary school in the shade of the Tree of Peace. Miki, a grade 6 teacher, was also a participant in The Tracking Project‘s mentor program and spent a year on sabbatical as a staff member with our project. She and Kahele also organized the Alaka’i Project, our Hawaiian mentoring project. John at the tree in early 2002. We were also told by Ron Kimball and Walter Ritte on Moloka’i that our tree at the community center grew so well and the shade was so appreciated by the islands’ kupuna (elders), that the county planted more monkeypod trees to join the Tree of Peace, creating a grove where people can now sit in the shade for public events. Kamehameha Schools elementary staff listen to the Thanksgiving Address beside the Tree of Peace. Our work in Hawai’i continues as does our work with Native and non-Native communities worldwide. Jake Swamp has been around the world with his peace tree ceremony, inspiring the planting of millions of trees in China, Australia and other countries. (In 1983, a proposal made to the United Nations calling for “all people of peace on earth to begin planting Trees of Peace” was answered by a commitment from 100 nations and 100 world organizations to plant one billion trees around the world in an “International Tree Project” as part of the U.N.’s “International Year of Youth” in 1985). These trees of peace remind us that our true vocation as human beings on this earth is to harmonize our energies with the energies of the natural world and to live with one another and all living things in peace. May the Tree of Peace flourish.